Modern neuroscience suggests that number, space and time aren't so much features of the outside world but more a result of the brain circuitry we evolved to move around in it. And this circuitry is all about judging less than/greater than relationships. In the 19th century the mathematician Bernard Riemann suggested that the mathematical ideas of space, quantity and measure should not depend on the outside world, but defined abstractly and in relation to each other. Joselle DiNunzio Kehoe finds some interesting parallels between these two ideas. While many see mathematics as the study of patterns, it is still often expected to be the study of magnitudes — comparisons of the measure of things, in the most general sense. This is what ties modern mathematics to its roots in arithmetic, algebra, and geometry. But the concept of number has evolved since the early days, now including not only counting numbers, but also all the real numbers that lie along the number line and more exotic concepts such as complex numbers. Mathematicians have also found surprising alternatives to the geometry laid down by Euclid over 2000 years ago. This has pushed mathematics towards greater generality and abstraction. By the late nineteenth century, mathematical concepts no longer relied on our immediate experience. Numbers were no longer understood as things in themselves. They could only be understood in their relation to each other. And geometric ideas were no longer confined to being a description of the space we experience. Because most of us begin learning mathematics when we learn to count, numbers appear to be the primary idea. And the Euclidean geometry of ancient Greece is still considered by many to be precisely the analysis of spatial relationships. But if we consider that these familiar ideas reflect the way we see the world, it is possible to imagine that their meaning relies on a deeper structure, analogous to the way that an image we see in front of us relies on the brain's construction of a plethora of visual stimuli. It may be that modern mathematics, while more difficult to understand, parallels more rudimentary levels of perception. 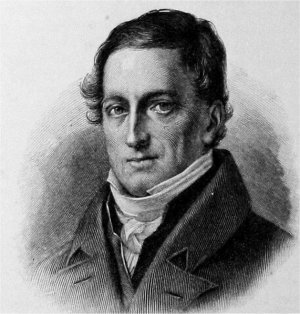 Carl Friedrich Gauss (1777–1855) in a painting by Christian Albrecht Jensen. By the nineteenth century mathematicians struggled with the meaning and implications of their ideas and tried to shore up the foundation of mathematics, fearing perhaps that the weightlessness of the purely abstract could threaten the integrity of their discipline. They reflected on, and argued about, the meaning of their work — what it could address, and how. What was a function? Was "infinity" simply shorthand for an unending process, or was it something? 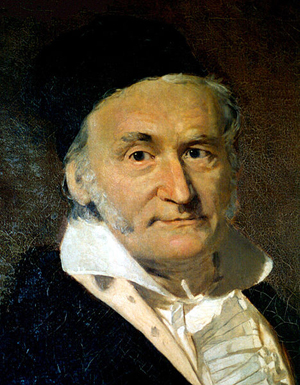 In 1829 the legendary mathematician Carl Friedrich Gauss wrote, "mathematics has for its object all extensive quantities." Other kinds of quantities could be considered "only to the extent that they depend on the extensive." By extensive quantities Gauss meant lines that are described by length, surfaces, solid bodies and angles, as well as time and number. The non-extensive quantities he allowed included speed, density, hardness, height, the depth and strength of tones, the depth and strength of light, and probability. But he also provided an important qualification, "One quantity in itself cannot be the object of a mathematical investigation: mathematics considers quantities only in their relation to one another." Here, quantities and their measures are considered together, and they can each be thought of as magnitudes. 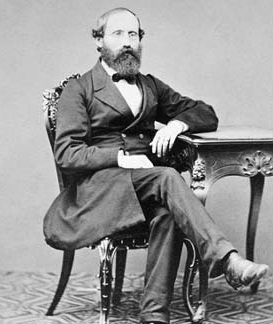 Gauss's student Bernhard Riemann brought a definitive clarification to the meaning of measure. He acknowledged in the introduction to his famous lecture On the hypotheses which lie at the bases of geometry that this was influenced, not only by Gauss, but also by ideas of the philosopher John Friedrich Herbart, who pioneered early studies of perception and learning. Herbart's work played a significant role in debates centered on how the mind brings structure to sensation. Like cognitive scientists today, Herbart broke down the world of appearances into the subjective impressions that build it. He rejected the idea that space was the thing that contained the physical world. For him spatial forms were mental images derived from relationships among any number of things we experience. They arise in our conception of time (the future being ahead of us and the past behind us), as well as number, and are applied to all aspects of the physical world. Herbart accepted that any perceived object could be thought of as a collection of properties bound together. Many of these properties are produced interactively — colour, for example, happens when light interacts with an object and with the eye. In his collected works, published in 1850 and 1851, Herbart defined space as, "the symbol of the possible community of things standing in causal relationship." The eyes and the sense of touch, separately triggered, then later fused and developed, begin the production of space in our minds. For Herbart visual images were like hypotheses that are constantly adjusted in response to feedback from the eye which acts as the measuring device. 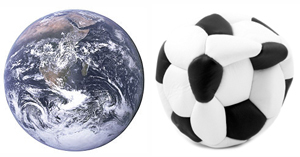 The surfaces of the Earth and the deflated football are both examples of manifolds. If you forget their precise geometry you can consider them equivalent as one can be deformed into the other without tearing. Geometry is an additional structure brought to an object rather than a defining feature. Image of Earth courtesy NASA. Riemann suggested that before we can understand Gauss' extensive quantities we need a broader notion of magnitude or measure, one that isn't tied to space as we perceive it. He described this first notion as "an antecedent general concept which admits of different ways of determination." This general concept would be analogous to colour while individual shades of the color blue or yellow correspond to its "different ways of determination." In Riemann's geometry a space is defined as an abstract mathematical object, which he called a manifold. A manifold does not come equipped with a specific metric measuring length, area or curvature — rather it comes with a whole range of possible metrics, again defined as abstract mathematical objects that all exhibit the same general structure. (See the article Hidden dimensions for more on manifolds and their metrics.) The precise geometric properties of a space depend on what metric you choose. In this way Riemann established that geometry is not the analysis of space but, rather, an additional structure brought to a space. He distinguished the pure idea of space from the three-dimensional region that defines the position of objects in our world. Herbart's thinking foreshadows what studies in cognitive science now show us about how we perceive space and magnitude — it may be that Riemann's mathematical insights reflect them. Mathematicians have always thought of measurement in two ways: geometrically and arithmetically. These may look like alternative views, but their careful entwinement is crucial to the abundance of mathematical ideas. Curiously, neuroimaging studies now suggest that the external experience of space, and the symbolic representation of number activate the same networks of neurons. In a review article on this interaction, educational neuroscientist Edward Hubbard from the University of Wisconsin, together with colleagues, hypothesise that mathematical concepts such as Cartesian coordinates or the complex plane, "although they appear by cultural invention, were selected as useful mental tools because they fit well in the pre-existing architecture of our primate cerebral representations". In other words, they line up with cognitive mechanisms already in place. Recent findings in cognitive neuroscience are also beginning to unravel how the body perceives magnitudes through sensory-motor systems. Variations in size, speed, quantity and duration, are registered in the brain by electro-chemical changes in neurons. The neurons that respond to these different magnitudes share a common neural network. In a survey of this research, cognitive neuroscientists Domenica Bueti and Vincent Walsh tell us that the brain does not treat temporal perception, spatial perception and perceived quantity as different. The neural processing of size is generalised. They propose that the brain manages numerical systems with circuitry that is equipped for action related to "more than-less than", "faster-slower", "nearer-farther", "bigger-smaller", computations of "any kind of stuff in the external world". This neural activity allows us to successfully reach, grasp, throw or point. Bueti and Walsh argue further that, "it is on these abilities that discrete numerical abilities hitched an evolutionary ride," given the primitive need to make these kinds of judgments of space and time. Number then, as a measure, is not primary — what comes first is our need to move accurately. If the circuitry used to encode different magnitudes is shared, researchers expected that the perception of things like duration, size, and number, even brightness would affect each other. This has been demonstrated with what are called interference studies. For example, in one such study, children were given the information required to tell that two trains were travelling at the same speed. If the trains differed in size, however, they often decided that the larger of two trains ran faster. In a recent essay, mathematician Yehuda Rav chooses the path suggested by Hubbard. He argues that mathematics grows on the scaffolding of cognitive mechanisms that have become genetically fixed with human adaptation. Mathematics, then, not only reflects cognitive structures, but builds on cognitive processes, extending the range of what we can perceive. It is, he says, "A singularly rich cognition pool of mankind from which schemes can be drawn for formulating theories…". Studies in biology and cognitive science point to biological processes that appear to be mathematically oriented — there are cells in our visual system that are sensitive only to vertical structures, our perception of distance arises from the geometry of binocular vision and our early learning seems based on calculating probabilities. The body is built to create structure from sensory data — to weave it into the objects we perceive. Riemann was not engaged in a psychological analysis of our experience of magnitude. But he was interested in the essence of ideas that were driven by experience and motivated to get behind the appearance of things in general and of space in particular. He recognised that the most powerful generality would be found in the purest rendering of the fundamentals. His observation that any notion of magnitude, or measure, requires a preliminary general concept on which to rest, lines up with the brain's lack of distinction between temporal, spatial and quantitative perception. His careful analysis of what one could mean by magnitude or space may touch on the very way we perceive the world, using his own hunch for how the pieces could be teased out of the appearances the brain constructs, and used again to see more. Perhaps mathematics elaborates on what an organism does to be in its world. As suggested by biologists Humberto Maturana and Francisco Varela, "every act of knowing brings forth a world." The body and the world cannot be separated. Time, after all, is measured in heartbeats. The Tree of Knowledge, H. Maturana and F. Varela, 1987 Shambhala Publications. 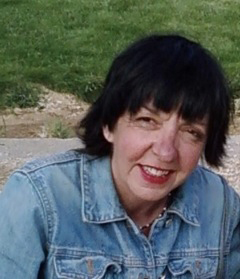 Joselle DiNunzio Kehoe is a writer and Lecturer of Mathematics at the University of Texas at Dallas. For the past few years she has been most involved in a book project that considers a biological view of mathematics. It is this project that also guides the choice of subjects found in her blogs at Mathematics Rising. A fascinating article, but it would be nice if links or citations could be provided to some of the papers it mentions. - "In a review article on this interaction, educational neuroscientist Edward Hubbard from the University of Wisconsin, together with colleagues, hypothesise that ..."
- "In a survey of this research, cognitive neuroscientists Domenica Bueti and Vincent Walsh tell us that ..."
- "In a recent essay, mathematician Yehuda Rav chooses ..."
- "As suggested by biologists Humberto Maturana and Francisco Varela ..."
At all these spots, links are provided to the webpages of the scientists mentioned, but that's not terribly helpful to me: I'd like to know exactly what paper is being referred to. I have in the past argued that the core of practical mathematics is precise efficient communication about real world problems, something that would have developed most likely before standard systems of writing. What we know of as mathematics is then an evolved system of common patterns and a reasoning system built upon that.